The Mountain Goats (stylized "the Mountain Goats") is an American indie rock band formed in Claremont, CA by singer-songwriter John Darnielle. 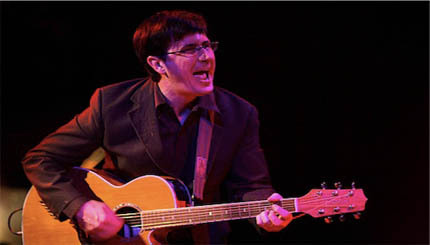 For many years, the sole member of The Mountain Goats was Darnielle himself, despite the plural moniker. Darnielle remains the sole core member of the band, but has worked with a variety of collaborators over the years, including bassist Peter Hughes, drummer Jon Wurster (of Superchunk), singer-songwriter Franklin Bruno, bassist and vocalist Rachel Ware, singer-songwriter/producer John Vanderslice, guitarist Kaki King, and Annie Clark (of St. Vincent).